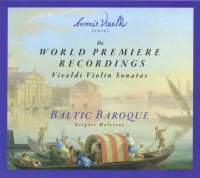 Each of the works in Estonian Record Productions’ collection of hitherto unrecorded sonatas by Antonio Vivaldi comes with a fascinating story, captivatingly told in the booklet notes by Anna Bulycheva. The first of these, in G major, RV 776, has a sort of Doppelgänger, although with different slow movements. Maria Krestinskaya, the violinist in the Sonata, produces from the 1629 Giovanni Paolo Maggini violin upon which she plays a succulent tone in cantabile passages, and brings an energetic snap to the fast movements. Evgeny Sviridov takes over as soloist in the Sinfonia in b, RV 35a, a reworking by the composer of a Sonata (RV 35), with, as Bulycheva notes, a more church-like first movement replacing the original Sonata’s dance-like one. About halfway through that first movement occurs a harmonic passage so striking that even Vivaldi’s admiring followers may find something new. Like Krestinskaya, Sviridov produces generally ingratiating sonorities from his anonymous Italian violin. Bulycheva reveals that the authorship of the Sonata in D Minor, RV 13, has been questioned due to its appearing in a manuscript that attributes it to Johan Helmick Roman, although Bulycheva considers the work Vivaldian in its core. In this Sonata, Andreo Reshetin plays a 17th-century Polish violin by Marcin Groblicz. In the fast movements that predominate, his straightforward vigor (as, for example, in the minuet-like second, which he renders with unmannered piquancy) makes a strong case for the work itself, though not perhaps for its authorship by Vivaldi. Sofia Maltizova plays a 2011 Russian violin, built in the Baroque manner, in RV 809, a work that Grigori Maltizov found, according to Bulycheva, in a hand-written collection of sonatas by Gaetano Meneghetti. In this case, however, Bulycheva considers the style less obviously Vivaldi’s. Be that as it may, Maltizova brings such élan to the second movement and such affecting lyricism to the third that the work is well worth hearing, regardless of its composer’s identity. The Sonata, RV 785, played in this program by Andrei Reshetin, occurs as well, according to the notes, in a collection by Antonio Zani; Reshetin plays a version based on a manuscript held in Stockholm that omits one of the movements enumerated by Peter Ryom in his catalog of Vivaldi’s works. The Sonata concludes with a set of variations that’s considerably longer than the other three movements combined. Reshetin slides in one of these in a way reminiscent of some typical Baroque imitations of the mewling of a cat, but in general the variations will seem to many listeners to lack the ingenious fantasy of, for example, those of Giuseppe Tartini on Arcangelo Corelli’s famous Gavotte. The Sonata in G Major, RV 24, in a reading by Maria Krestinskaya, brings the program to a conclusion. If Ryom had reservations about attributing the work to Vivaldi, Bulycheva considers them insufficient. In any case, Krestinskaya gives the work an eloquent reading that’s joyous as well in the fast movements. The ambiances from two different locations, one a church and the other a house, nevertheless match each other well in clear recorded sound that allows the instruments to blend in a highly ingratiating amalgam. The generally invigorating approach of both soloists and ensemble lends the works themselves an opportunity to put their best foot forward in this, their initial sortie. Very strongly recommended for notes, performances, recorded sound, and the general interest all these create together; obligatory for Vivaldi specialists.